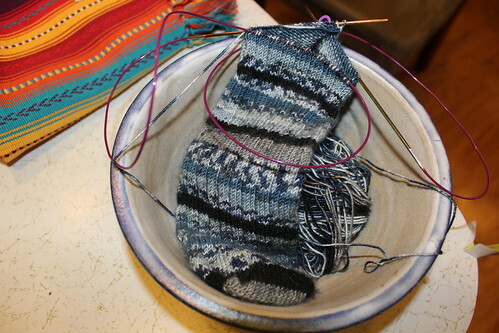 Like most other WIP Wednesdays, I’m linking up with a couple of other cool blogs, Tami Ami, Frontier Dreams KCCO and Ginny’s Knit Along. Check them out and prepare to be inspired! A few more inches and this one will ride off into the sunset of FOs. 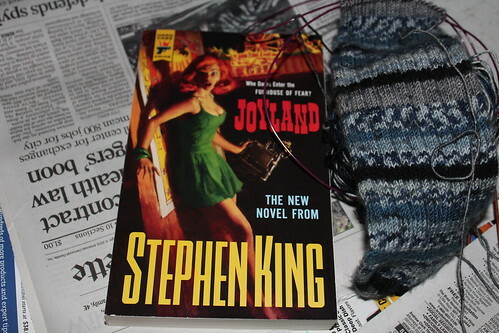 I finally made it to my local BN yesterday and purchased a copy of Stephen King’s newest, Joyland. I haven’t officially started reading it, except skimming through the pages and reading a sentence or two. Anxiously waiting for at least a 15 minute lull in the day so I can really get started. Here’s the finished product I promised yesterday; it’s still a tad damp, but I think it turned out pretty well, don’t you? 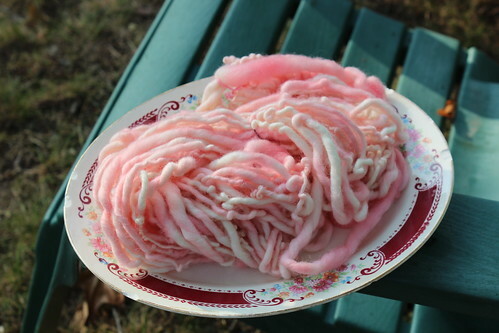 First Try at Dyeing with Kool-aid – Pink Lemonade. I found some really unattractive 100% yarn in the stash, it may be Lion Brand 100% Wool, sort of an oatmeal color. I’ve just now decided to overdye (if that’s the word) another color, possibly purple. Show and tell tomorrow.